One of the agenda items at Tuesday’s City Council meeting involved a Heritage Tree that was apparently quite tall and had been growing for decades. In its growth it has embraced (literally) a power pole, and attempts to keep it reasonable have failed – in fact part of one side of the tree leaned precariously to one side and one of its lines was braced by a neighbor to keep it from being ensnarled with any tall vehicle that might pass under it. It was deemed dangerous from many angles. Consensus was to remove it – Edison would remove the power pole and replace it. Neighbors in the area agreed with its removal including one who lived a bit further away who said, although they loved the tree, it did “block their view”. Everyone chuckled over this remark. Although technically not on the homeowners’ property, the previous owners did keep the tree trimmed. A neighbor commented that children often played nearby. Who is in charge of replacing the tree? Edison was involved in this particular issue obviously because the power pole was being hugged by the tree and the only way to mitigate this situation was removing both. But at the whose cost? Whose approval? What timeframe, especially with the advent of the rainy season and potential for high winds. My suggestion is that each tree that is on the Heritage Tree be inspected not only for its health, but for the implications it has for future growth that might create a dangerous situation, be it with power poles (another reason to go underground) or falling over/endangering property/people with its age and location. I suggest this for several reasons – obviously to protect lives and property of those who live around these trees, and make plans for its replacement. Also it should be decided who has responsibility for its upkeep and determination of cutting/removing. Do we need to wait until tragedy strikes or can we be more proactive as concerned citizens – rather than reactive – and have policies/procedures in place? I would recommend that if such a “committee be formed” that it is balanced and not wanting to spend thousands of dollars debating/getting experts and alienating our community further. Let’s be reasonable. I suggest that instead of trying to save a questionable/dangerous tree for another twenty years, we spend the money in purchasing a new tree that fits the community, meets safety requirement as it ages, and is not expensive to maintain. I hate to think how much the city has spent in “trimming/cleaning” up after some species of trees that have been put on an exalted alter. What’s become of our beloved country? How did a story about an Indiana teen, intent on shooting middle school students yesterday, barely make the news? Has gun violence become so commonplace (i.e. expected) that no one really cares any longer? On behalf of the families whose children were massacred at Columbine, Sandy Hook, Parkland and many other schools, I want them to know this writer never will forget or overlook their loss. And frankly, neither should the media. The historic inventory of Laguna trees is being systematically destroyed. Gasoline poured on trees in South Laguna, Montage trees defaced, and dozens of trees chopped down (e.g. in North Laguna). This is a disgrace to our City. The so-called art lovers should revisit the paintings of William Wendt and others and learn the trees of this current Council destruction order were the subjects of exquisite oil paintings. A sad holiday season to those who love foliage and nature. Perhaps the ‘’non-native’’ folks who despise our trees should leave so an errant branch per chance doesn’t fall and hurt them. Their disease is called hylophobia. Sally Sykes Forbes died peacefully at her home in Emerald Bay on October 28, 2018 at the age of 90. Sally and her twin sister, Cynthia, were born in Brecksville, Ohio to William and Dorothy Sykes. Sally attended Richfield High School and graduated from Ohio Wesleyan University where she was an active member of Kappa Kappa Gamma sorority. After graduation, Sally took a job working for the Stouffer’s human resources department. It was there she met her husband Gordon Angus Forbes. The two were married in 1955. They began their family in Chicago, but Gordon’s work with Stouffer’s prompted the young family, now made up of three children Andrew, Carrie and Peter, to move west. They came to Laguna Beach in 1962. Shortly thereafter, in 1963, their youngest daughter, Sara, was born. Even with four children Sally was always active in her community. Committed to the mental health field, she earned her MFCC from Chapman University and worked for the community mental health clinic. She, along with Lucinda Prewitt, was instrumental in developing the City’s youth shelter (now called the CSP Youth Shelter), which is still in service today. Additionally, Sally was active in her Emerald Bay community, serving on many committees, as well as extending a hand to both friends and strangers alike. Sally was a force. That is a fact agreed upon by all who knew this incredibly vibrant and strong-willed woman. In addition to her children, Sally was blessed with nine grandchildren, Chrissy, William, Amber, Brianna, Brandon, Peighton, Kate, Morgan and Ben, as well as seven great grandchildren, Aiden, Harley, Makayla, Evander, Mac, Cash and James. Nieces Tori, Elizabeth and nephew Sam complete Sally’s devoted family. As a longtime member of Saint Mary’s Episcopal Church who served on the vestry as a lay minister and was active in the Episcopal Church Women’s group, Sally will be laid to rest there, next to her beloved husband Gordon. I was surprised to learn that Balboa Island has approved funding for undergrounding their utilities. I had to read it twice. Yes, every area can succumb to horrific fires – but if I were to put a list together, I would put Laguna Beach closer to the top than Balboa Island. Probably wouldn’t be as expensive as the proposed plan, which was turned down by some, well…I won’t go there. I truly hope that part of the agenda in making our city as fire safe as we can looks again at this project. With so many businesses/people living in that part of Laguna Beach that is also a significant transportation corridor and that the a fire can go uphill and strike Top of the World, etc. I think it behooves us to bring this to the forefront and perhaps actually become a priority soon. As we have seen it is not just the financial damage for some, but it is emotional and physical damage for all of us. At the Planning Commission meeting on the Cleo Street project on Wednesday, Nov 7, 2018, someone attempting to defend the project against charges of incompatibility with the neighborhood asked rhetorically, “Who decided Laguna is supposed to look a certain way?” The answer to that would be “More than in most places, the community,” and this distinctive idea goes back to the town’s beginnings. The plein air painters had set the tone by helping spread the word about the beauty of Laguna, and early residents took every opportunity to preserve and enhance it. In 1925 the Woman’s Club launched a campaign to make it “the Paradise of the Pacific,” distributing 700 trees for planting on Arbor Day. Photographs of new houses “in the Laguna spirit” were often featured in the newspaper, and artists such as Anna Hills and Frank Cuprien played key roles in city planning. The city’s first improvement project was announced in the South Coast News for February 1931 with a rendering of the proposed building and the headline “NEW LAGUNA SEWAGE TREATMENT PLANT IS ATTRACTIVE IN DESIGN.” The city’s first land use plan, adopted in 1940, included restrictions on building size, and its 1959 General Plan called for “keeping residential and commercial development in the central area low.” When the planning commission proposed a maximum height of 50 feet in 1971, a citizens’ group circulated petitions for an initiative that would limit buildings citywide to 36 feet, and 75 percent of the voters said yes. In the course of the seventies, as development around it intensified, the city found additional ways of preserving its character, including a program for preserving heritage trees and a historic register that today includes more than 300 homes. Design review of proposed development was required as early as 1972 and extended to residences in 1986. In the early 1970s Fred Lang led the South Laguna Civic Association in preparing the South Laguna Specific Plan, which led to the creation of the Village Green and the preservation of the hillsides. The Downtown Specific Plan, adopted in 1989, was designed to protect the downtown’s small scale and variety of shops and services. 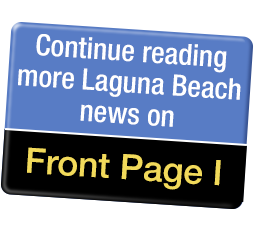 These measures have been kept up to date over the years, and at the meeting November 7 it was apparent that community concern about how Laguna is supposed to look is alive and well. The recent rains give us a short respite from the fearsome future. But, let us not be deluded. The increasing occurrence and ferocity of firestorms of these last years everywhere, in the West particularly, are only a predicted preview of what may come. Hopefully not. Laguna Beach has had its existence just saved back in ‘93 by the change in the winds and we have subsequently been hit by at least two fires requiring air drops in the canyon in the last few years. Aliso Creek was the scene of the last attack in June, requiring substantial air and ground assistance, and we were luckily aided by the lack of winds. We clearly need as much planning, luck, assistance and help as anywhere else in the west. One of the seemingly best ideas that we have instituted has been the use of the glorious goatherd and its management. But, I would submit that we need more herds inserted despite the curious assertion of a recent council candidate that the inevitable deposit of goats’ poop outweighs the value of the use and safety provided, as if deer, coyotes, squirrels, rodents, fox, rabbits, porcupines, possums, raccoons, lions may but apparently minimize by recycling their own. I would submit and request that the City immediately acquire/employ/hire/contract two or three more herds to circulate around more frequently and that these herds be given the authority to eat back further and deeper the heavy brush, etc., protective zone created. Having no idea of the why not, should the safety zone not be enlarged to 100 yards +/-? Mr. Lardie does a terrific job in his retirement managing the single herd but why not double or triple his groups? Some areas, such as Park Ave canyon, seems overgrown even now and the safety zone impinged. Brush and bush grow quickly, especially with rain. His biggest “problem” was not being as mean spirited as those who put their own interests before the national interest, which he refused to do. That is a “problem” we want and need our President to have...every time. Lura and I are in Kona and woke to this sad news. Comforted by thinking about how unsurpassed his life was in every respect. Also reflecting that his faith sustained his resolve in all he did to the very end. So glad my daughter Natalie and son-in-law Jonathan joined his granddaughter Marshall for the 2018 Bush family celebrity golf invitational at Kennebunkport, and got to visit with the President at Walker’s Point this summer. Natalie and Marshall were flower girls at Scott and Lindsay Bush’s wedding in the White House years. We all were inspired to serve and he made being conscientious a higher value than being recognized for success. We wanted to be part of something that mattered and made a difference, something bigger than just us. He had the big shoulders, he was all the big man we needed, big enough he did not need to act big, and that made us want all the more to serve and be part of his cause. He modeled competence with compassion, strength with restraint. He taught us all how to handle success and failure with grace and character. What a gift, enabling his people to go our own ways and succeed in post-public service careers and life. I am the “local political gadfly” Howard Hills referred to in his recent letter to the editor. Clearly, he and I have a difference of opinion when it comes to interpreting “The Times They Are a-Changin’” and the impact Bob Dylan’s iconic song had on turning Orange County bright blue last month. I first crossed paths with Jimmy Carter’s campaign in 1974. That is when Hamilton Jordan, Carter’s political eyes and ears, used to visit the Democratic National Committee offices in Washington. I was a fundraiser for the DNC at the time and remember telling friends to watch Carter. After Gary Hart made a campaign stop in Newport in 1983, I told the event organizers, David Stein, Bernie Schneider and the late Stuart Karl, I did not share their enthusiasm for the Colorado lawmaker. They were sure the young senator had a chance of defeating Ronald Reagan the following year, but I said no. Like a lot of people in 1990, I wondered which Democrat would capture my party’s 1992 nomination. When Bill Clinton convinced Orange County Republican heavyweights like Kathryn Thompson, Roger Johnson and Harriett Wieder to cross party lines and join his campaign, I remember telling friends to watch Clinton. In 2007, I was picked to be Barack Obama’s wing man during a stop in Newport Coast. After spending an hour introducing him one-on-one to a room full of VIPs, I was convinced he was the candidate to watch in ‘08. Over many objections, some from my own family, I decided to support Obama a year before he made history. And then there was Hillary Clinton in 2016. I spent most of the year promoting her efforts to become America’s first female president. That is until mid-September, six weeks before the general election, when I wrote a piece in the Register urging Clinton to fire her inner circle of advisors. I was attacked by Democrats near and far for being a “know-nothing” but guess what? It turns out this gadfly’s radar was more right than wrong. Which brings me to the 2020 presidential candidates today. If you believe the pundits, Sen. Bernie Sanders of Vt., Sen. Elizabeth Warren of Mass., former Vice President Joe Biden and Sen. Kamala Harris of Calif. are the early front-runners. Almost everyone else who is mentioned – Sen. Cory Booker of N.J., Sen. Kirsten Gillibrand of N.Y., former Gov. Terry McAuliffe of Va. and former New York City Mayor Michael Bloomberg – hails from the East Coast. Three other possible contenders, Sen. Sharrod Brown of Ohio, Beto O’Rourke of Texas and entertainer Oprah Winfrey, also deserve mentioning. Having been a student of politics since the late 1960s, I know most of these wannabe candidates will come and go long before the Iowa caucus in 2020. One person that has staying power beyond the borders of the Hawkeye State is Sen. Amy Klobuchar of Minn. She has all the credentials necessary to win the presidency two years from now. First, she already has a 12-year track record as a senator; second, she is from the Midwest; and, third, she is, well, a woman. Klobuchar’s impressive win November 6th proved she not only did well in urban areas of Minnesota, but she also knew how to rack up votes in rural parts of the state as well. That is a quality many, if not most, of her Democratic rivals would envy during the primaries and/or have a problem duplicating in the 2020 general election. As mentioned, I have watched dark horse candidates Carter, Clinton and Obama win the presidency. No pundit I know gave any of them much of a chance of winning two years before the general election. The thing I like most about Amy Klobuchar is she is hiding in plain sight. According to Business Insider, she could “bury” Donald Trump. That said, senator, if you decide to run for president count this local political gadfly in. My political radar says you are the one to watch. Over three years ago, the city agreed in federal Judge David O. Carter’s court to begin a 10-year rehabilitation schedule for our sanitary sewer system, funding $3.5 million per year for 10 years, $35 million total. That was codified, i.e. formally agreed to contractually as a result of litigation initiated by California River Watch in October 2014. My NGO, Clean Water Now (CWN), was the sole protectionist group to formally sign on to the lawsuit. CWN joined because after 15 years of pro bono work on this issue as watchdogs, little rehabilitation or improvement had taken place. For us it was unfinished business, our previous efforts around 2000 on the same topic were being ignored, the city not fulfilling its promises to both California and the Federal Environmental Protection Agencies. Fined substantially by Cal-EPA, a harsh warning by USEPA and a promised “Zero Tolerance” policy ratified, the city is a classic backslider. It really hit home for myself and my neighbors here in Victoria Beach and just south along Coast Highway near Ruby’s and the Montage, as proven in court. Complaining letters about noxious odors had been written previously to the city over the course of nearly a decade, demanding redress and relief. The city acknowledged the more pungent, problematic and objectionably smelly, deficient lift station gas reductions during the proceedings. Relatively inexpensive oxygen scrubbers were to be installed in all of our pump stations. So they said. We along South Coast Highway were assured that we’d be a high priority being chronically affected: The lift station near Nyes Place by Dizz’s and the one on the stairs leading down to Victoria Beach near Sunset were mentioned as prime candidates. That rancid stench of H2S along PCH from Bluebird to the Montage Resort has never been abated, at its worst early mornings due to stagnant flows. Don’t believe us? Get up early and walk, bike or commute this stretch in the wee hours of the morning: It’s what we wake up to, and like most here we like to leave our windows open – so leave your car windows open if you drive through as suggested, take a whiff and see if you’d like that to begin your day. Now the litigation expenses regarding the Coastal Treatment Plant dispute with Moulton Niguel Water District in Aliso Creek Canyon has resulted in the City delaying indefinitely the rehab of the Victoria Beach lift/pump stations, using Laguna’s plaintiff role and attorney expenses as an excuse to continue to do nothing it seems. City Hall keeps alleging surpluses yet avoids compliance with mandated legal cures, it seems…meanwhile our already antiquated storm water and sewer systems continue to degrade. LB taxpayers and fiscal watchdogs, self-described community eco-activists, media columnists plus council candidates petitioning at city budget hearings seem to be unaware of that compact with the court system, the plaintiffs demands and concerns about sewage spills and noxious gas emissions, which are unsafe, create hazardous air quality and beach conditions that trigger closures and decimate fragile marine eco-systems. Viewing budgets subsequent to the settlement agreement, I can’t find any earmarked funds that confirm or sustain the city’s broken promises. Nor am I reassured by the lack of specificity regarding prioritization. Myself and my alarmed letter-writing neighbors are justifiably wondering: Are we in Victoria Beach being punished for being whistleblowers, for exercising our rights to acquire a redress of legitimate grievances? Obviously, no good deed goes unpunished here.